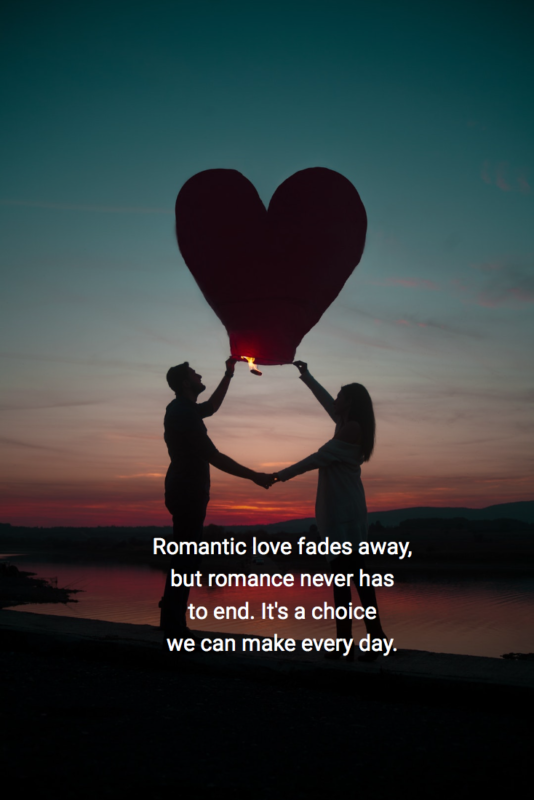 Romance is a choice we can make every day! As a couple you can influence the way you feel about each other by reconstructing the conditions of romantic love. When you treat each other the way you did in happier times, you will begin to identify each other as a source of pleasure once again. What could be more powerful than doing the very things your partner has identified that make her or him feel loved?? Here’s a tool that will help you reconstruct those conditions of romantic love. It’s a very practical way to choose romance every day, and keep the fires of romantic love burning. Click on the link above and print out two copies (one for you and one for your partner). Then follow the instructions below. In this exercise, you and your partner give each other the keys to your heart – specific “caring behaviors” that make you feel loved. After you go through it, there’s a link below where you can read the story of Wendy and Tom – how their relationship died, and then how it went from “flatlined” to “fully-alive” using this tool. (1) what your partner is already doing that pleases you. (2) what your partner used to do that pleased you. (3) what have always wanted but never asked for. These may be very private fantasies, but should not be a present source of conflict. Fill in your answers on the spaces provided on the printout. 4. On your partner’s list put an X by any items you are not willing to do at this time, making the rest of the list conflict-free. 5. Then beginning tomorrow, do at least two of these behaviors each day for two months. Start with the easier ones first and then move to the more difficult ones. These acts are to be GIFTS, NOT OBLIGATIONS. However, do them whether you feel like it or not. The act of doing these things will begin to reignite your desire for each other. Keep going and you will rekindle the feelings of romance, and create a safety zone that will allow deeper connection and bonding. If either of you experience some resistance with this exercise, keep on doing these caring behaviors until the resistance is overcome. Do it even if you don’t feel it. Your feelings will follow. But remember, the process won’t work unless you work the process. Sandy’s list included things like surprise outings and weekend adventures. Those kinds of things really make her feel loved and cared about. Her efforts to do things on my list were about like mine. One here and one there. To be honest, this exercise didn’t do for us what I was telling my clients it would do for them! Then I got where she was going with that. Until last year, California went through about six years of serious drought where reservoirs dried up, and a statewide proclamation of emergency was issued. During that time there would be a day or two, here and there, when it would rain cats and dogs all day long. And it felt so good every time all that rain poured down. But those few times of rain had no effect whatsoever on our reservoirs or on the drought. Wow. I get that. That really makes sense. We realize we have to do these caring behaviors REGULARLY and NOT STOP! The exercise you printed out says “two a day for the next two months”! If two is too much start with one a day and work up from there. Then it’s something hopefully you get addicted to – in a good way. Sandy and I are rebooting our efforts. And it’s paying off. Print out The Rekindling Exercise and let’s get started! Click here to read how Wendy and Tom used this tool and saw their dead marriage resurrected! Let everyone know how it’s working in the comment section below. Also, please share this blog with your friends and on social media! Let’s continue to be part of a relationship revolution! Need a marriage resurrection? How to go from "flatlined" to "fully-alive"
Previous Previous post: Why the best relationship tools to improve your marriage don’t work!